1. The national “seven headed wildbeast” progression terminates into 7th King, 7th “head” Anglo-American world power in a national sense. (Rev13:1); That 7th King Anglo-American national progression proceeds with the globalist 8th King designate who arose for the first time in 1919 (League of Nations) at the same approximate time as the 7th King became an official Anglo-American national alliance (WW1). 2. The 7th King and 8th King designate both appear at approximately the same time in 1914-1919 and both proceed in their respective final world developments and both progressions are fully prophetic. A. While the 7th King is going into nation-state power based 7th King zenith over the intervening century since 1914, the 8th King is the United Nations “image of the wildbeast” (Rev13:11-15; Rev17:8-11) designate of final world government rulership not yet realized as complete world government also in a progressive development toward that objective of climax global sovereignty. 3. The United Nations (UN) is the “image” of world government “scarlet wildbeast” totality (rev17:8-11), not world government, not yet the real thing, the true 8th King of Revelation 17:11-18 culmination. 5. The 7th King deposition is in national sovereign power of the whole global nation-state system, not destruction, and it will become known globally as the 8th King ascendancy into world government will also become known. 6. While the 7th King proceeds from 1914 in world history and prophecy convergent to the zenith of Anglo-American national alliance power, the 8th King begins (1914-1919) the first of four cycles of world war-to-world-government globalist world power development. 1. The 8th King forming system always resolves those hot and cold (Dan11:29) world war conflicts into a UN presentation in 1919, 1945 and 1990, after WW1, WW2 and Cold WW3 in the first three cycles of four total. 3. Those four UN 8th King cycles are ALL in prophecy. Daniel 11:30-45 and Daniel 8:23-25 are 3rd UN (1990; Dan11:31b, Dan8:23) to 4th UN (future; Dan11:45; Dan8:25) sequences that connect those final two UN placements of the four total, to the first two UN placements of 1919, and 1945. 4. The fourth cycle of this now obvious world-war-to-world-government formula will be the one to finally produce full 8th King world government. 1. In essence Bethel says God by prophecy does not foretell 8th King world government completion. 3. To aid this implication and to keep JWs from looking deeper Bethel sells the delusion the UN “image” is the end of the world power progression. Aiding this delusion the 7th King national world power system is the pinnacle of world power in that nation-state realm. King North is covered over with USSR national bloc fictions. The King of Fierce Countenance is covered over with WW2 era Anglo-American 7th King national power fictions. 4. Thus the Bethel subversion uses past prophetic error from periods before the 3rd UN 8th King activity of 1990, and simply continues the illusion into delusion as if that 3rd UN placement never did occur, as if it is insignificant in all aspects of it’s “New World Order” presentation. 5. Daniel 8 and 11 final 8th King details are further covered up with WW2 and Cold War national significance fictions, and all those national level distractions which are incompletions are used to divert JW awareness to the past. Since 1990 and that actually greatly significant 3rd United nations “New World Order” placement, Bethel has been using former interpretation of Daniel 8:11-25 and Daniel 11:27-45 to cover up 8th King King North activity from a period whose subsequent globalizing developments prove those former interpretations are invalid. 6. The Governing Body makes certain no prophecy is updated past 1969 understanding. 2. Bethel conceals the 3rd UN placement significance as prophecy and even significant in relation to 8th King forming globalization that accelerated from 1990 forward changing the globalizing nature of government, finance and military that even the world’s secular researchers explain thoroughly. 3. Thus JWs cannot connect Daniel 8 and 11 to final 8th King globalizing activity since 1990. JWs do not recognize Daniel 8 and 11 are where the 3rd and 4th 8th King manifestations are foretold. 4. In the very prophetic sequence that began this UN 3rd cycle in 1990, there is the reason why JWs are not finishing the prophetic forecast to 8th King world government. The final apostasy ALSO forms in the same Daniel 8:11-14 and Daniel 11:30-35 sequences that result in the 3rd UN placements of Daniel 11:8:23a, Daniel 11:31b. 5. 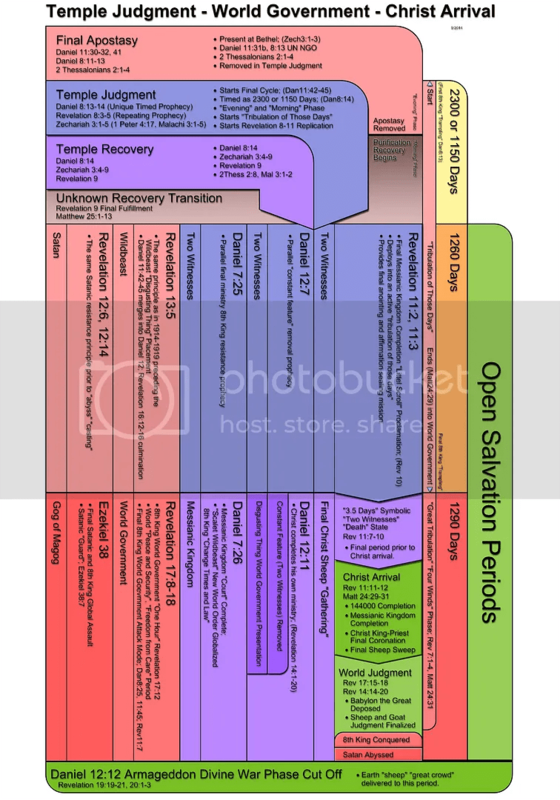 Both Daniel 8:11-14, 23-25 and 11:27-45 describe the overall 3rd and 4th UN 8th King progression. 1. Thus Jehovah’s witnesses are unaware the apostasy will trigger a final temple judgment, and that desolation by divine requirement for the UN NGO “transgression causing desolation” (Dan8:13-14) is going to be sold to JWs with the premature “end of the world” delusion that the Daniel 11:44 overly advanced positioning and this subversion of interpretation will allow. 2. It will be tribulation, but it goes on for some years, and it, like WW1, WW2, and Cold WW3 is designed to resolve and end into 8th King world government at the end of this fourth 8th King cycle that it will be starting at that time as Daniel 11:42-43. 3. 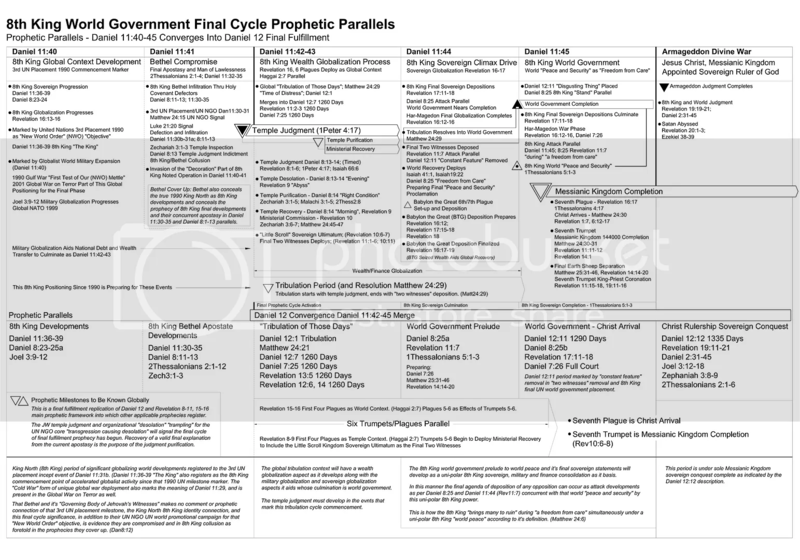 Jehovah’s witnesses are not understanding the four cycles of the world-war-to-world-government are also completing in Daniel 8 and 11 to complete the first two UN cycles that Jehovah’s witnesses did explain as prophecy and world events properly in 1919 and 1945 progressively. 5. Now as Daniel 11:42-45 fourth and final 8th King cycle to world government to start soon and terminate at Daniel 11:45 convergence into Daniel 12:11 final fulfillment activates the whole Daniel 12:7, 11 final fulfillment replication, Jehovah’s witnesses are not understanding the final 8th King cycle requirement, it’s approximated duration, and it’s world government completion significance over final years of global tribulation designed to resolve into 8th King King North full world government is what is actually to manifest next. 6. Bethel has all that reality in prophecy and coming 8th King world government culminating development since 1990 covered up with interpretive diversion and deceptions designed to make one thing look like another thing, “the end”, to Jehovah’s witnesses. 1. Daniel 8:11-25 and 11:27-45 are apostasy, temple judgment and the 3rd and 4th UN placement details resulting in 1990 events to climax in the fourth cycle of 8th King world government in the future. 3. Daniel 11:42-45 must converge into Daniel 12 final fulfillment in the “during that time” of the final 8th King cycle. 4. Daniel 11:45 must merge into Daniel 12:11 final fulfillment meaning as complete 8th King final “palatial tents” and “disgusting thing” placement. 5. King North and King of Fierce Countenance are 8th King world government final development and actual culmination. 6. 8th King world government is coming as the “scarlet wildbeast” complete global entity the UN “image” pictures and is beyond the 7th King and UN “image” in scope and finality of power. 7. The 7th King nation-state system must be made subservient by and superceded by actual full 8th King global world government sovereignty over the final cycle. 9. Daniel 12:7 replications repeats the same 1260 day sequence in Revelation 11:2-3. Thus Revelation 8-11 and Revelation 16 repeat in final form.